Attractions: A popular snowed-over road among cross-country skiers on lightweight touring gear and for snowshoers. Snowshoers and skiers tend to slog up the steadily climbing road for as long as energy allows, then turn around and make quick work of the return. The views are forested and pleasant, although not spectacular unless you carry on all the way to Rainy Pass (about 4 miles one way) or unless you use this road to climb some of the surrounding summits like Union and Jove peaks — see our backcountry skiing guidebook for the details of skiing or snowshoeing these peaks. 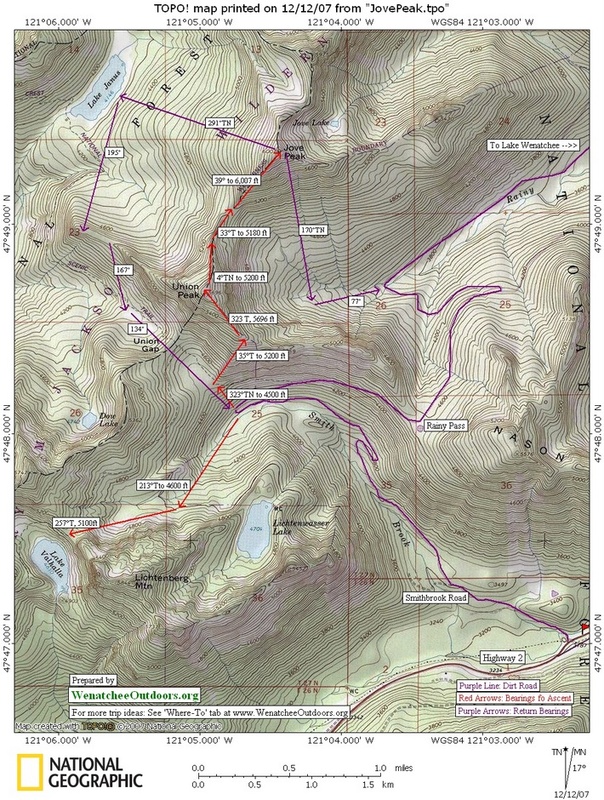 Maps: See our topo map below. 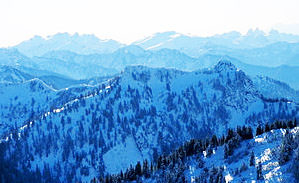 General Region: Stevens Pass Area. Skill Level: 2 (intermediate) if skiing on lightweight cross-country gear or 1 (beginner) for snowshoeing. Fitness Level: 2+ (intermediate to strong intermediate) to reach Rainy Pass. Distance: 8 miles roundtrip to Rainy Pass. Elevation Gain: About 1450 feet to Rainy Pass. 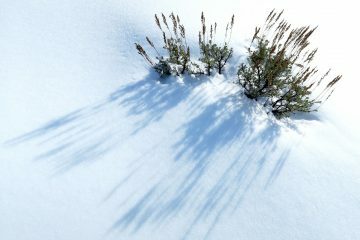 Winter Access. Drive Highway 2 west of Leavenworth until you’re about 4 miles east of Stevens Pass. Park on the north side of Highway 2 at milepost 68.9 about 0.2 miles before the Smithbrook Road. The shoulder is plowed extra-wide here for winter recreationalists using the Smithbrook Road. If you’re coming from the west, go about 6 miles east of Stevens Pass to the Stevens Pass Nordic Area, turn left on the road that cuts across the median and leads to the westbound lanes of Highway 2. Now drive about 1.5 miles west and use the parking area described above for the Smithbrook Road. –Ski west along the shoulder of the highway about 0.2 miles to the Smithbrook Road (elevation 3,200 feet). 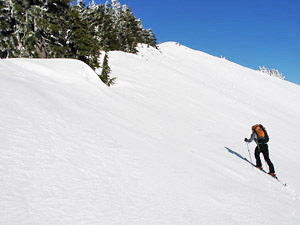 A backcountry skier accessing one of the peaks above the Smithbrook Road. –For this tour, simply stay on the road at the big switchback and follow the road another 1.2 miles to Rainy Pass (el 4,630 feet). Note: this section of road has the best views but it also traverses steep slopes that do avalanche — don’t ski this final mile if the avalanche hazard is high. — For the return trip, retrace the route. On skis the return will go quickly. Be aware that the snow conditions on the road are often icy or chunky and on lightweight skis with three-pin or Nordic-norm bindings, this can make for challenging skiing and plenty of opportunity for face planting. 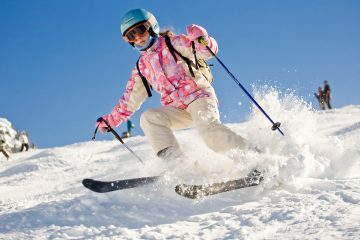 Beginner and ever intermediate skiers will find there are times when skinny skins will control speed on the descent and reduce the chance of injury. Uses Allowed. In winter the road is heavily used by cross-country skiers, backcountry skiers, and snowshoers. Snowmobiles have a hard tie accessing the road from the parking areas, but they are allowed on the road. Because the area is already very heavily used in winter by skiers and snowshoers and because machine access to the road in winter is poor, the Smithbrook Road would make a logical non-motorized winter recreation area in the future (like the Tronsen Meadows area on Blewett Pass). Hazards. Some parts of the route (particularly during the last mile) expose you to considerable avalanche hazard—be aware, be properly equipped, be knowledgeable, and be somewhere else when the slide hazard is high. Leave It Better Than You found It. This should be every outdoor user’s goal. Important Disclaimer. Treat this information as recommendations, not gospel. Things change and those contributing these reports are volunteers–they may make mistakes, fail to give complete information, or may not know all the issues affecting a route. If things go wrong, you are completely responsible for yourself and your actions. If you can’t live with that, you are prohibited from using our information.